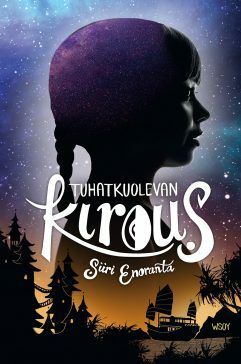 WINNER OF THE FINLANDIA PRIZE 2018 FOR THE BEST CHILDREN’S/YA TITLE OF THE YEAR! Pau cuts her thigh-length hair to her cheekbones and is delighted with her fashionable new look. But to Pau’s great disappointment her mother Alesiana is far from pleased. In fact, she is clearly terrified of what Pau has done. What could be so important about long hair? Alesiana refuses to explain herself and Pau grows increasingly suspicious of her mother as she is clearly keeping secrets from her. Few years later those secrets begin to unravel. Pau has never known for her family to have any connection to Magi, those who use magic and spells in Indorasia. At the age of fourteen she is surprised and delighted to find that she has the required aptitude for making spells. And not just aptitude, but skill. Pau, who has never excelled at anything, is thrilled to find that her magic is special, potent. She also learns that a childhood accident has forged a tie between her and the mysterious rebel leader Nubya; a powerful, immortal Magi. Nubya leads her rebel troops in a fight against a government sanctioned Bureau, the BLEM, whose aim is to rid the world of the mysterious Cinderlings. When spells are made and magic is used these child-like creatures emerge from the shadows where they live, reaching out for the magic. Years ago BLEM had ruled them to be evil, something to be suppressed for the good of the people. The Cinderlingsscare most people, and even Pau feels frightened when they touch her with their burned little hands. It is people’s fear of these mysterious beings that plays directly into BLEM’s hands, and BLEM’s plans for the extinction of the Cinderlings are now in full motion. Nubya and her rebels cannot claim to know the full role of the Cinderlings in the world, but they know enough to believe that the Cinderlings must be saved. The two sides are at war, and Pau’s unique connection to Nubya places her in grave danger. Nubya also has plans for Pau and the adventure ahead is deadly – and magical. The Burning Dark by Siiri Enoranta is both a staggering fantasy adventure, and a perceptive account of the fear of the unknown and prejudices of people – of the difficulty of discerning between right and wrong.